"Great, it's snowing!" are my first thoughts on days like today, when I pull up the blinds in my bedroom and look out into winter wonderland. For when it snows, it isn't cold. That rule may be scientifically inaccurate, and "not cold" is certainly an impression open to debate. But if you find yourself living in Québec this winter, then "cold" refers to days with the mercury around -24C, and a wind chill factor that removes another ten degrees from that. So when a snowy day raises temperatures to a mild -6C for a while, you too will start to appreciate the shovelling duty as a welcome side-effect of a hot spell. 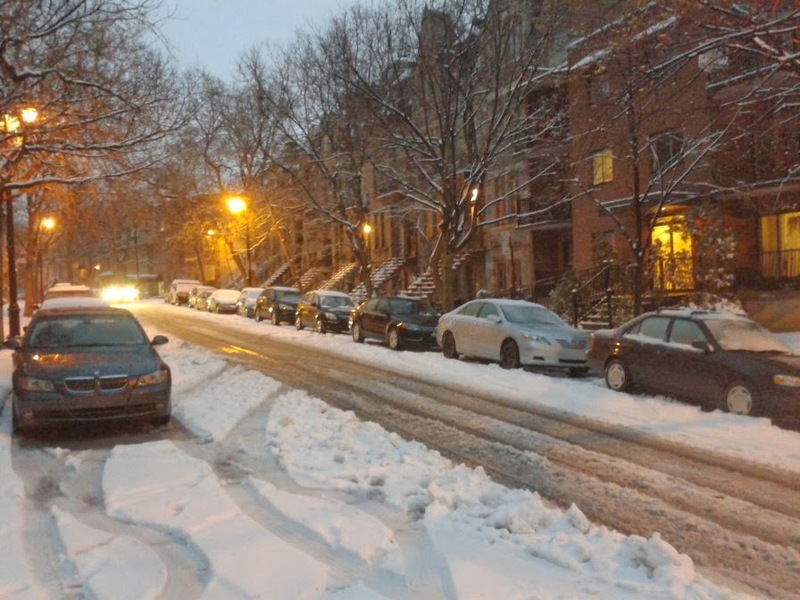 A week or two of arctic lows are not unusual for Montréal in January, and this journal has reported on them and the associated rituals before. What makes this winter worse was not only the early onset of the deep-freeze conditions in the first half of December, but also their persistence ever since. I made it out of the Great White North just before a mighty "Polar Vortex" took a hold of much of the American Northeast at Christmas, and when my plane descended into Montréal again after the New Year, I was amazed to see the St. Laurence river and its shipping canal frozen solid - something the strong currents and fleet of icebreakers typically prevent. Of course, while the Vortex brought much of the U.S. to a stand-still and forced Toronto's Pearson Airport to close, Montréal is much better equipped to handle such events. Hydro-Québec sets its electricity output to max, citizens crank up their cheap baseboard heaters, and everybody stays indoors. The fabulously warm Hudson's Bay Blanket that I found under the Christmas Tree didn't arrive a minute too soon. Unfortunately, I can't just cuddle up and wait for spring to arrive. The office calls, and if it doesn't snow, the five minute walk to the metro becomes just ridiculously cold. The uninitiated fail to grasp precisely how cold -32C is. As you step outside, it is as if the air had gone. Your lungs are in shock and refuse to breathe for a moment. You set out, and before you've made it to the corner of your street, the cold has infiltrated however many layers you are wearing, and is now creeping down your back. You try not to slip on the layer of fresh slush, which sits atop a glacier-like base of solid ice, formed from past freeze-melt-freeze cycles. By the time you made it to the first traffic light, you can feel how your metal watch case has cooled down so much under your glove that it now starts chilling your wrist. Your nose goes numb, which at least stops it from running. You protect your face by holding your mittens in front of it, and yet by the time you reach the sanctuary of the subway, you can wipe mini ice flakes from your lips. Your cheeks are so rosy they'd glow in the dark. I am not exaggerating. And while the odd day like this can be a fun experience (in a dip-into-the-cold-after-sauna kind of way), week after week of it starts wearing me down. Unlike in Switzerland, winter doesn't really take breaks here. When the first snow falls in late November, it stays on the ground until April. "We had a 55 degree temperature difference", said my colleague who spent a few days in Florida, where her in-laws were horrified to notice that Canadian conditions made the Celsius and Farenheit scales converge. Not in my hottest dreams would I dare asking for a trip to Florida. No, I'd be perfectly happy with a chance to chill out for a few hours in the balmy confines of my grocery store's walk-in beer freezer. It's set to +2C.